RICHARDSON, TX--(Marketwire - Feb 15, 2012) - Whether starting a new life together or celebrating a milestone; weddings, religious celebrations and social receptions of all types come easy with the well-rounded offering of services provided by one of the most sophisticated hotels in Richardson, Texas. Ethnic and religious weddings and events for all faiths and nationalities including Jewish Kosher catering for Bar/Bat Mitzvahs are welcomed at the Renaissance Dallas Richardson Hotel where elegant facilities, attentive service and a full-service catering team stand ready to assist guests in hosting unique and stylish events. Staffed with well-trained event managers and professional caterers, this Richardson, Texas hotel's dedication to accommodating the needs of all guests is witnessed in its exceptional offering of ethnic packages. And, in recognizing the importance of tradition, the hotel also graciously allows outside catering for special occasions. As one of the premier wedding venues in Richardson, this sophisticated hotel welcomes Hindu Indian, Islamic, Chinese, Vietnamese, Asian or any other ethic wedding or social celebration with 30,000 square feet of flexible event space. Whether planning a large gala or intimate gathering, this Richardson wedding venue's facilities and inviting guest accommodations are ideal. In addition to attentive one-on-one service by certified wedding and event managers, the Renaissance also offers a variety of online tools to help with planning. Menus for weddings, banquets and even audio-visual services are available to view online, along with floor plans, capacity charts and special group offers. The Marriott Honeymoon Gift Registry is also an exciting way to make a dream honeymoon come true. 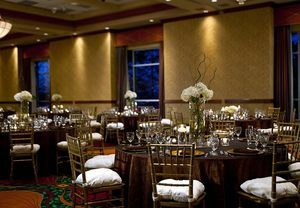 Convenient among Richardson wedding locations, the Renaissance is just minutes from Dallas/Fort Worth International Airport and Dallas/Love Field, so out-of-town guests can easily make their way to the hotel where they can rest easy amidst four-star accommodations while enjoying the excitement of the occasion. Standard guest room features include plush bedding ensembles, wireless high-speed Internet access, coffee/tea service, Plug-In Technology, marble bathrooms and room service. In-room entertainment includes cable/satellite service with premium movie channels and pay-per-view movie options over a 32-inch LCD TV. Eclectic on-site dining is offered at Maestro's, a contemporary restaurant open daily for breakfast, lunch and dinner. The Starbuck's Coffee House, Caffeina's, is also open for breakfast and lunch, and the Take 5 Atrium Lounge offers a light afternoon and dinner menu, fine cocktails and drinks overlooking the adjacent Galatyn Fountains Plaza. The Renaissance Dallas Richardson Hotel welcomes travelers with a vibrant décor featuring a signature garden atrium style designed to present an inviting atmosphere that mirrors the outstanding service and lavish accommodations found at this prominent hotel. Conveniently located in the midst of North Dallas, the Renaissance is a preferred destination for many area Synagogues, Hindu Temples, The Dallas Islamic Community, US- China Chamber of Commerce, Greater Dallas Asian American Chamber of Commerce and DFW Vietnamese Chamber of Commerce. Discover a leader among 4-star hotels in Dallas at the Renaissance Dallas Richardson Hotel. Our spacious guest rooms boast the perfect blend of luxury & comfort, with plush bedding, high-speed Internet, 32'' flat-screen TVs & premium movie channels.